Senga Nengudi’s performance-based sculptures and installations explore aspects of the human body in relation to ritual, philosophy, and spirituality. In the 1960s and 1970s, Nengudi’s avant-garde work helped bring traditional African forms into the mix of Western modernism. Sculptures like R.S.V.P. 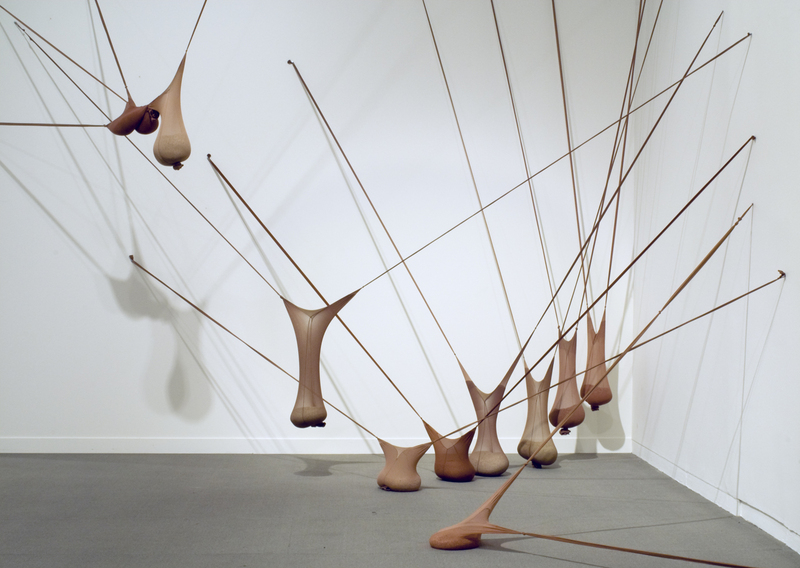 were first created in the 1970s, and they synthesize Nengudi’s unique formal language of movement and improvisation with her interest in materials that she finds at hand. Nengudi coaxes form out of ordinary nylon stockings by pulling, twisting, and knotting them to create pendulous sacks or tautly outstretched limbs. These bulging, flesh-toned, anthropomorphized abstractions suggest the resilience of the human body. Like molted snakeskins, they retain the “residue” of the body and the “energy” of the wearer, suggesting the fragility and sensuality of flesh itself. From One Source Many Rivers, Nengudi’s latest work, is on view at the foot of the Grand Staircase. A sand painting, it embodies cross-cultural commonalities among forms as diverse as Tibetan mandalas, Navajo sand paintings, and aboriginal ground paintings from Australia. For Nengudi, the ephemeral nature of her work is a metaphor for the impermanence of life. Information from the Carnegie International Website. “Maren and Me” – Senga Nengudi’s 2009 statement about her collaborations with Maren Hassinger. nylon mesh and sand, dimensions variable.